The Tamanag Heritage trail takes you throughverdant midlands of Nepal experiencing the beauty of this mountain region and culture of the people who live here. The trail passes through traditional Tamang villages where life, culture and crafts haveremained unchanged since the beginning of the settlement. Warm traditional welcome hosted by the locals, their elaborate costumes, rich architecture of their mountain houses and the ancient monasteries and places of pray add color to the experiences of this trail. In addition to the culture experiences, the trek also offers wilderness experience through beautiful landscapes of alpine terrain, flat meadows and rhododendron forest. Day 01: Arrive Kathmandu International Airport, More Than Mountain staffs meet and transfer to Hotel on bb basis. Day 02: Kathmandu full day Tour start from Boudhhanath,Pashupatinath,Patan City and Swoyambhunath. O/N in Hotel on bb basis. Day 03: Drive from Kathmandu to Syabrubesi (1467 m.) via Trishuli (Nuwakot) takes about eight hours. Day 04: Trek from Syabrubesi to Gatlang (2238m.) via Goljung takes about six hours. Day 05: Trek from Gatlang to Tatopani (2607m.) takes about three hours. Day 06: Trek from Tatopani to Thuman (2338m.) via Nagthali (3165m.) takes about five hours. Day 07: Trek from Thuman to Briddim (2229m.) via Lingling takes about seven hours. Day 08: Trek from Briddim to Lama Hotel (2470m.) takes about six hours. Day 09: Trek from Lama Hotel to Langtang (3430m.) takes about five hours. Day 10: Trek from Langtang to Kyangjin (3870m.) takes about three hours. Day 11: Rest day at Kyangjin Gompa and excursion in and around. Day 12: Trek from Kyangjin to Lama Hotel (2470m.) takes about six hours. Day 13: Trek from Lama Hotel to Thulo Syabru (2130m.) takes about six and half hours. Day 14: Trek from Thulo Syabru to Sing Gompa (3330m) takes about five hours. Day 15: Trek from Sing Gompa to Dhunche (2030 m.) takes about four hours. Day 16: Drive from Dhunche to Kathmandu takes about eight hours. Day 18: Kathmandu free day O/N in hotel on bb basis. Kathmandu driving through scenic foothills and ridgeline vistas to Syabru Besi passing through Dhunche. Tamang settlement. One can visit a Tamang monastery and beautiful Parvatikunda Lake at Gatlang. believed that taking a dip into this spring would heal you from your aches and pains. 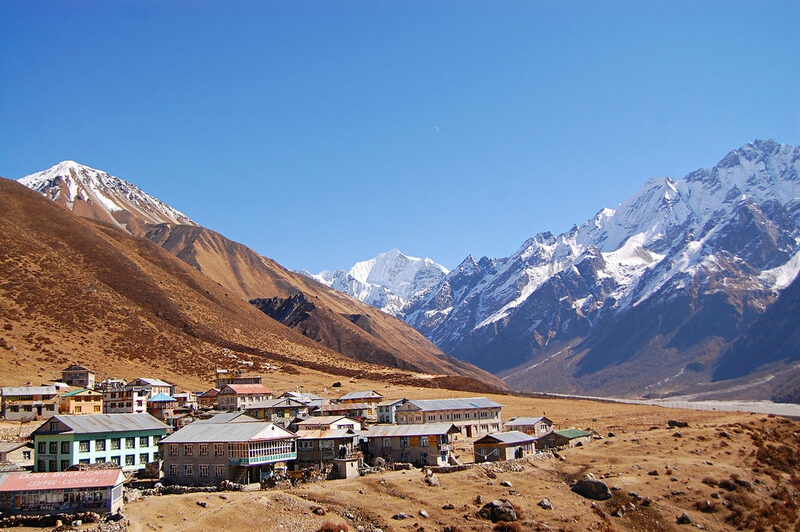 view of Langtang, Kerung, Ganesh Himal, Sanjen ranges can be distinctly experienced from Nagthali. Day 07: Trek from Thuman to Briddim (2229m.) via Lingling takes about seven hours. You can experience village life of Briddim. that the settlement of Lama Hotel is located on the banks of Langtang River and surrounded by lush forests and mountains. the Langtang range. You can also experience and make observation of Tibetan settlements. This day you can see the glaciated valley of Kyangjin on the lap of Langtang Lirung and surrounded by snowy mountains. 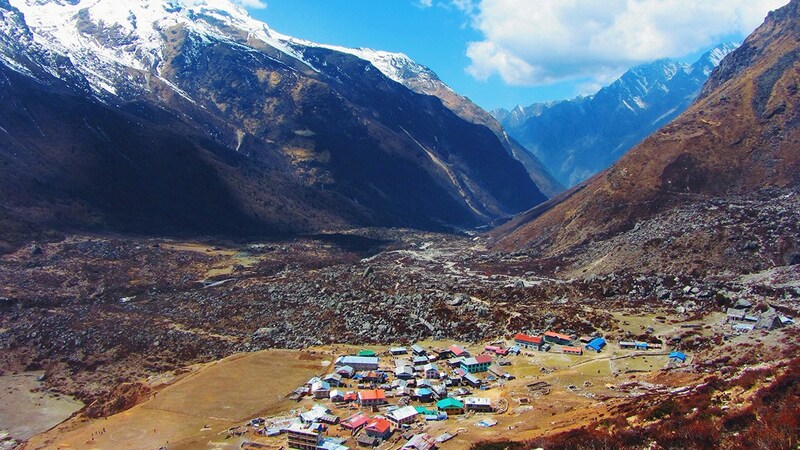 Ri [4350m], directly behind the village, for a breath-taking panorama of the Langtang peaks. continue the steep descent to Lama Hotel. where each house is set above its neighbor, in a long line up the very crest of the ridge. of oak, fir and rhododendron to the top of a ridge. From here it is only a short descent to Sing Gompa. path along Ghatte Khola (stream) till Dhunche..